1.1. The responsibility for running club matches resides with the Match Secretary, with a monthly review at general meetings. 1.2 The Permit Holders will adhere to the standing Bye-laws as printed in the permit book. 1.3 Life members and Vice Presidents may only be proposed by either the Chairman or Secretary and must receive support of three-quarters of the members of the Company. 1.4 The members shall report quarterly on the state of warning signs covering power cables. 1.5 The Company shall maintain Public liability insurance to cover its members and Permit Holders on all Company waters. 1.6 Any leakage of information from members or permit holders regarding the Company’s business will be seen as bring the Company into disrepute. Such member or permit holder will lose his/her position as a member and or their permit. 1.7 A member missing three consecutive general meetings without good reason, may have their membership of the Company revoked by the Directors in accordance with the Articles of Association. 2.1 The following classes of Permits are available within the Company and are only valid where both the individual angler and the Company hold a current signed and addressed Permit ticket and counterfoil. These are not transferable. 2.2 Temporary Permitsare available from the appointed Company’s Bailiffs and agents. 2.3 Members and Permit Holders who fail to comply with the byelaws, and or whose conduct or character is in the opinion of the Directors of the Company prejudicial to the Company or likely to bring the Company or sport into disrepute may be expelled and have their permits removed in accordance with the Articles of Association of the Company. 2.4 Infant is defined as beingless than twelve years of age on or before April 1st..
2.5 Junior is defined as being over twelve and under seventeen years of age on or before April 1st. 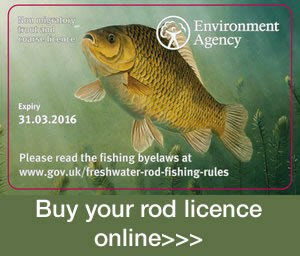 2.6 Entitlement to a concessionary permit, must show at the time of purchase a current Environment Agency Concessionary rod licence. 2.7 All Annual Permits sold by the Company’s appointed agents / bailiffs must be signed and addressed when purchased. 2.8 It is the responsibility of the Company’s agents / bailiffs to ensure that all counterfoils are returned to the Company. 3.2 No fish (alive or dead) should be taken away from the water from which it was caught without the express permission of the KLAA secretary tel 07876 491748. to do so may give rise to a civil or criminal prosecution under schedule 1 section 2 of the theft act. 3.3 Any person who, whilst fishing or in going to or returning from, shall do any willful damage to fencesor otherwise, or deposit litter shall be liable to forfeit their ticket and permit and be expelled from the Company. 3.4 No unofficial matches may be fished on Company waters without prior consent of the secretary. 3.5 Any person fishing where an official match is pegged and refusing to move may be expelled from the Company. 3.6 No more than three rods may be used at any one time, which must be used from the same swim, on non enclosed waters. A maximum of TWO rods only may be used on enclosed waters. 3.7 No rods may be left fishing unattended. 3.8 All live baits, which must be less than 5in (12.5cms) long, must be caught from the water where they are being used. 3.9 The use of gaffs is forbidden. 3.11 Fish should only be retained in keepnets for a maximum of 12 hours. 3.12 No fishing is permitted within 30 metres of power lines. 3.13 No parking on the banks is permitted on the following waters: Middle Level, Cut Off Channel and Relief Channel. 3.14 No fishing is permitted from bridges. 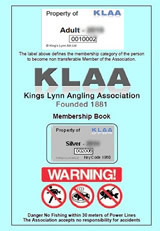 3.15 The use of Knotted keepnets on any KLAA water is not allowed. 3.16 A responsible person over 14yrs must accompany juniors under 14 at all times. 3.17 Fishing must be from designated platforms on all KLAA still waters where platforms are provided. 3.18 No swimming or bathing in KLAA waters. 3.19 All boat anglers require a full KLAA Permit. 3.20 All Permit Holders must hold a current EA license. 4.1 Water not to be disturbed before starting, except to clear peg of weeds, wet ground bait, position keep net, plumb depth. 4.3 All coarse fish in season to weigh except Pike and Zander. 4.4 All fish to be weighed at peg and returned to water. 4.5 No rods to be left fishing unattended. 4.6 Competitors will not be weighed in if any litter is left in the peg. 4.7 The Directors’ decision is final in all matters not covered by the above rules.